The past. The future. The Money. I received this message from Courtland Madock a former Cabrini Connections tutor/mentor volunteer this week, showing that the student she had worked with recently graduated from college. Just wanted to share with all of you that a couple of weeks before Christmas I had the distinct honor of watching Diara Fleming graduate from Northern Illinois University. It was one of the most amazing things I have witnessed. In just over 4 years, Diara has worked her way through NIU to graduate with a GPA of over 3.0. She plans to go on to graduate school as soon as possible. For those of you who don't know Diara, she was a bright student at both Cabrini Green Tutoring and the Cabrini Connections. She graduated from Walter Peyten High School and went straight to NIU. Although the road was not easy for her- Diara has done tremendously through her career at NIU and I am confident she will accomplish amazing things. Diara will tell you that she could not have graduated without the support of many others outside of her family which simply did not provide the support she needed. I tell you this not to be boastful in any way of my involvement- but to stress how critical it is for programs like Cabrini to continuing pairing up tutors/mentors so they have the support network they need to be successful. This message shows two goals of Cabrini Connections. One is that students finish high school and go on to college and graduate. The second is that volunteers who join the program and connect with teens stay involved for many years, even beyond the time when the teens finish high school and the formal 7th to 12th grade program. Courtland has been organizing the annual year-end dinner for Cabrini Connections for the past four years while she has continued to mentor Diara. Thus, her volunteer roles have changed and expanded. That's what we hope happens with many volunteers because if adults who don't live in poverty growth their own personal commitment and involvement we will be able to do much more over many years to help kids who do live in poverty. 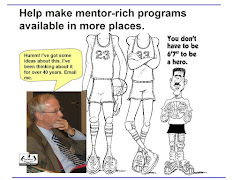 View this presentation at this link to see how volunteers can grow into leaders if well supported by tutor/mentor programs. If this is happening in one small program in Chicago, what can we do to help make programs like this available in hundreds of locations in Chicago and in other cities? 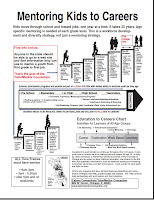 I encourage you to take a look at this Tutor/Mentor Connection logic model. b) you should accept that for these connections to be made linking inner city youth with workplace volunteers, structured organizations like Cabrini Connections need to be in place close enough to where kids can participate regularly, and safe enough that volunteers and kids both will be willing to attend on a consistent basis, supported with staff who mentor youth and volunteers over the years that they are connected. c) if you accept that organized programs are needed, you should be willing to support efforts that make such programs more available to youth in all poverty neighborhoods of big cities like Chicago. 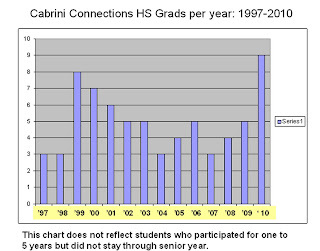 Over the past two weeks I’ve shown what Cabrini Connections has done over the past decade and since starting in 1993. I’ve shown what the Tutor/Mentor Connection has done to support programs like Cabrini Connections in all parts of Chicago and in other parts of the USA and the world. 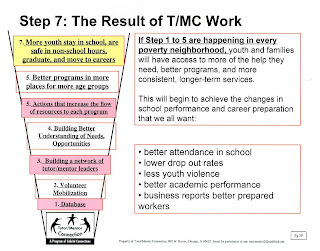 In many articles, like this one written by Mike Trakan of the T/MC we show the high costs of poverty and demonstrate way maps could be used by leaders to build a distribution of high-quality tutor/mentor programs and volunteer-based learning centers. Now let’s talk about the resources we have to do this work. This chart shows that T/MC has spent less than $200,000 to achieve its goals each year since 2000. It spent less than $125,000 from 2003 to 2007. Note, this number does not include the costs of rented space, utilities and insurance. 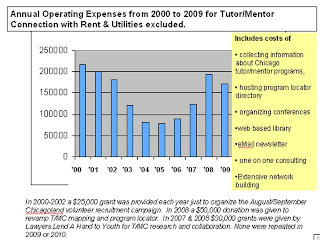 In spring 2007 a team of Net Impact Chicago volunteers compared the T/MC to mentoring partnerships operating in 10 different cities and states. This chart shows that the T/MC is serving the largest regional population. 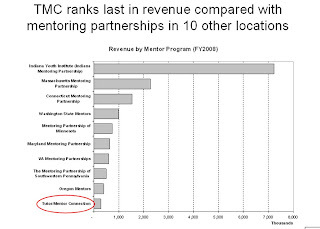 This chart shows that while T/MC serves the largest regional population, it has the lowest amount of revenue per year. The Net Impact report is available in the Tutor/Mentor Institute Library along with other ideas that we share. As with all T/MC projects this is still a work in progress due to lack of funding and inconsistent availability of volunteers and/or research interns. 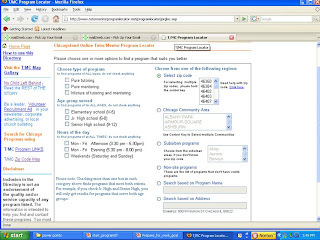 With additional funding and manpower T/MC could expand this research project, engage the leaders of mentoring partnerships and similar support networks in other cities, and create a source of information that every city could use to compare its own actions with peers, with a goal that each city and state is constantly innovating ways to improve what it does to help high quality, volunteer-based tutor/mentor programs reach young people who need such programs the most. This is just one example of opportunities for researchers to help T/MC help others. A grant writer visited the T/MC recently. As I walked her through the mapping, the social network analysis project, the Business School Connection Project and the OHATS sections she said over, and over, “that looks like a project a university would love to take on”. We agree. However without a funding partner to help get the attention of researchers who are already focused on their own projects, T/MC has not found any who are willing to find their own money to become a T/MC partner. As we enter the new decade the reports I’ve posted in the past two weeks show that Cabrini Connections, Tutor/Mentor Connection has had a tremendous impact on the teens who have participated in the program we operate near the Cabrini-Green area of Chicago. We’ve also built a system of support that is being used by thousands of people in Chicago and throughout the world. We’ve done this with limited money, which is also inconsistent in when it comes, and who is giving. We’ve engaged volunteers and interns. We’ve drawn from the talent and ideas of people throughout the world. Imagine what we might do if a benefactor decided to support CC, T/MC efforts in the way Leonardo da Vinci was supported by the Medici family during the Renaissance period. As we enter the new decade, we offer the opportunity for one, or many benefactors to share in the joy of helping others, of not only mentoring youth, but of mentoring volunteers, leaders of tutor/mentor programs all over the world, and mentoring leaders in business, government, religion and philanthropy so that there is a better operating system in place to support youth as they move from a birth in poverty, through formal school and learning, and into jobs and adult responsibilities. Help us turn my 35 years of experience leading a tutor/mentor program, along with the knowledge we’ve collected from others working throughout the world, into a Tutor/Mentor Institute that can continue to collect and share information, and expand the number of leaders who use this information, for many decades to come. See pdf review of past decade. 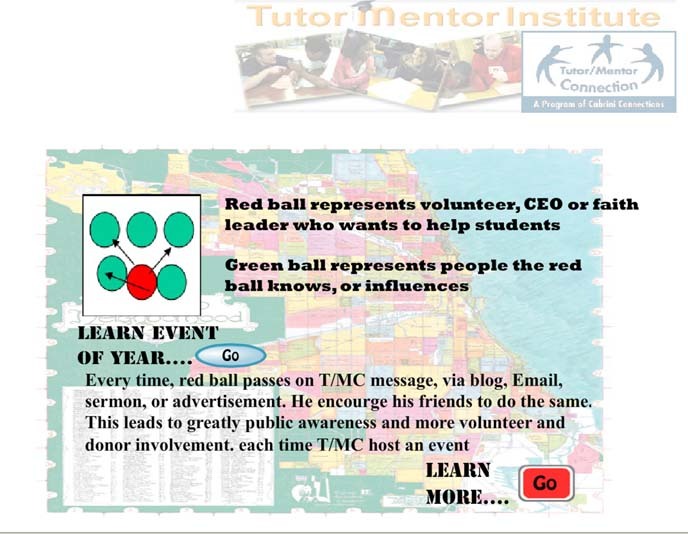 Update 5/11/2018 - In 2011 the Tutor/Mentor Connection was discontinued as a strategy of Cabrini Connections and the Tutor/Mentor Institute, LLC was created by Dan Bassill, founder of CC and the T/MC, to keep this work going in Chicago. Do The Right Thing - What Things? We all want to lower the high costs of poverty, improve the quality of the workforce, and prepare young people for successful adult lives. Yet, countless articles show that we’re not succeeding, especially in high poverty areas of Chicago and other parts of the country. Maybe it’s because we’re not focused on the same goals, and we don’t have a common blueprint? In researching for this article I did a Google search on “Do the Right Thing” and found a number of interesting links that I posted on the T/MC forum (no longer active). In the past week I showed how many teens Cabrini Connections has helped in the past decade. I wrote about how we've created an information library that we share with people at Cabrini Connections, and who lead other tutor/mentor programs. I wrote about how we've expanded our mapping capacity and drawn people together to share ideas with each other. This graphic shows the home page of the T/MC web site, with the four general goals that I've described. If you are given a $100 million dollars by your company, and your community, you need to apply some of the lessons in this Blueprint for Strategic Leadership article. I think you'd also need to do what I've outlined as the four steps of the T/MC strategy. Collect information related to the problem and potential solutions, bring more people together to look at that information, help them understand that, and help them converge on actions that if repeated over time would lead to better non-school support systems in high poverty neighborhoods, more consistent involvement of those beyond poverty to help those living in poverty, better schools, a more consistent flow of resources, and ultimately, more kids staying in school and leaving with momentum toward jobs and careers. If this is true, then what system would enable us to know which leaders are actually following this blueprint in their own actions? In the late 1990s I was contacted by Steve Roussos, a PhD student at the University of Kansas. He began to present workshops at T/MC conferences in Chicago and we began barnstorming ways to improve T/MC effectiveness. Steve introduce the idea of on-line documentation, that was piloted with a project in Kansas City. The idea of on-line documentation is that unless the various people involved in a project are documenting actions they take to achieve specific goals related to long-term mission, it would be impossible to really know over time what the group had accomplished, and/or who was responsible for any successes that were achieved. In a recent Stanford Social Innovation Review article this idea of documentation collaborative action was reviewed. Measuring Outcomes Across multiple organizations was also discussed here. 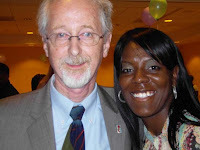 Thus T/MC was able to receive a small grant of $15,000 in 1999 and we paid Steve to build an Organizational History and Tracking System for the Tutor/Mentor Connection. We began documenting actions and recruiting people who were working with T/MC to document their actions. However, we did not get funding after the first year to keep working out the bugs in the system and to keep Steve involved. My mid 2002 we had documented over 400 actions and Steve wrote this report showing purpose of OHATS and creating an analysis of actions documented up to that point. As we moved into 2003 we found that the more actions we were documenting the less people were likely to scroll through the list of actions to read what was reported. We also found that the system was getting spammed. Without funds for Steve or other tech people we could not fix this. Thus in 2004-2006 not much was being documented. Then in 2007 a volunteer from Baltimore offered to help. He completely rebuilt the OHATS, adding in search features and charts that automatically changed with each new document added. We launched the new OHATS in 2008, and we’ve begun to reach out to invite others to use it. However, we still don’t have the money to keep updating the technology, nor do we have an analyst like Steve, to make sense of what is being reported. In the examples I pointed to above about on-line documentation systems and collaborative networks, the intermediary groups were spending over $1.5 million each year. T/MC has not had more than $200,000 in any year since 2001 for its entire operation. 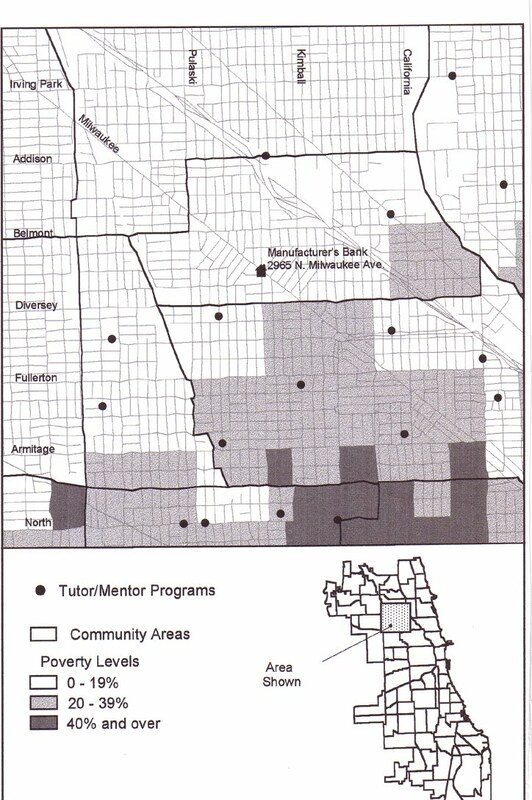 However, we’ve now documented more than 1500 actions over the past 10 years to help volunteer-based tutor/mentor programs grow in all high poverty neighborhoods of Chicago. One of the latest was by Nicola Avery, who lives in the United Kingdom. She’s visiting T/MC sites to borrow ideas she can use in the UK. A few weeks ago she created this video to show others how to use the OHATS. On the home page of OHATS you can see one of the charts, with a brief description of what that chart is focusing on. On this Metrics page you can see four additional charts. To help visitors to OHATS understand the purpose of each chart we add a link to a discussion page on our ning site where you can get a more in-depth understanding of that chart. Now, imagine what might be the result if hundreds of Chicago area leaders and volunteers -- representing business, philanthropy, government, volunteer and civic organizations, etc. -- were to become recorders, and were documenting their own actions toward these goals? Wouldn’t that mean more of us were following the same blueprint, and learning to see that specific actions lead to desired results, and that by repeating these actions over and over for many years we can get more of the results we all want. What is keeping this from happening? More tomorrow. See the entire group of charts in this Decade in Review PDF. 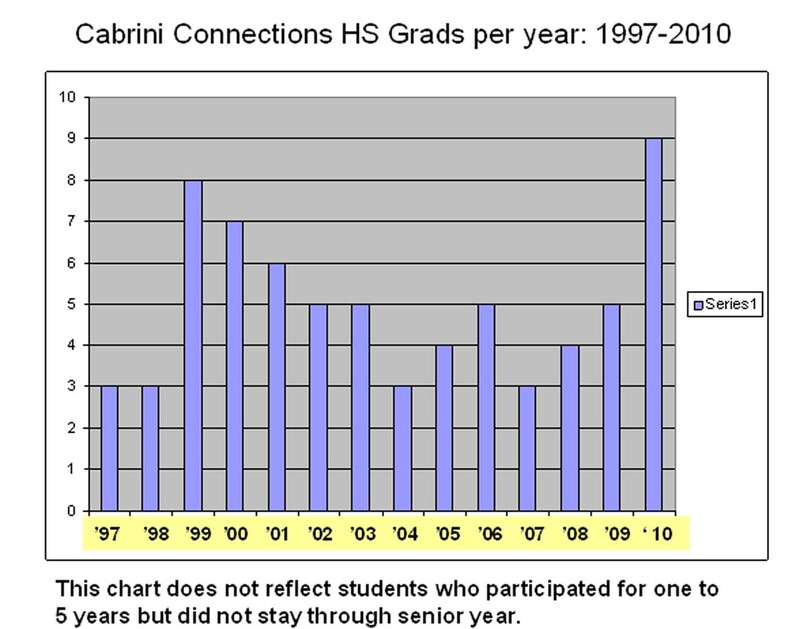 Last week I wrote about the number of students who had been part of Cabrini Connections each year since 2000. Then in follow up articles I showed how the Tutor/Mentor Connection (T/MC) has been collecting information, sharing that with maps and graphics, and organizing conferences and other network-building to encourage people to look at the information and use it to support their efforts to make more programs like Cabrini Connections available. Think of it, if one program can provide mentoring/tutoring support to 60-70 teens a year, then 100 programs in a huge city could reach 6,000 or more. The cost savings to society would be huge if youth in those programs avoided lives of crime or poverty because of more success in moving through school and into work. Then why not invest in the infrastructure needed to make this happen? 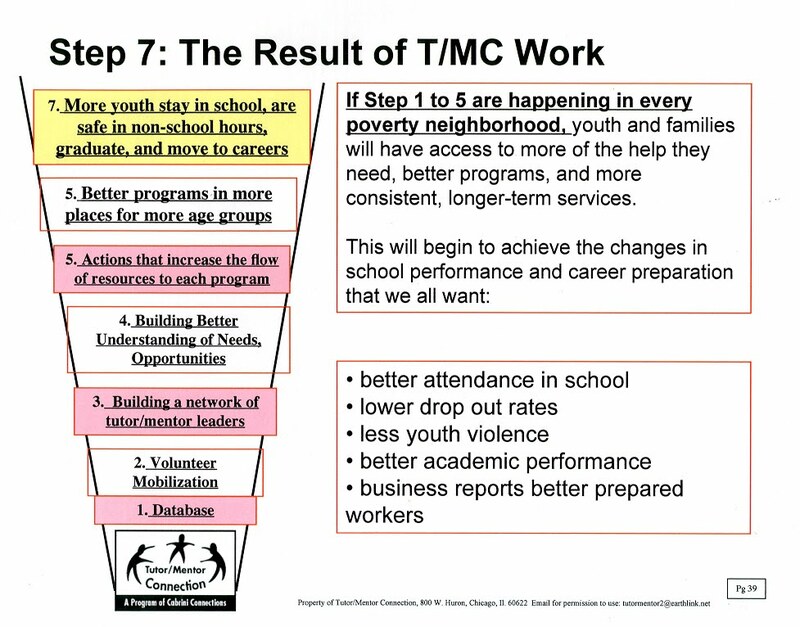 This graphic shows the process the T/MC supports. 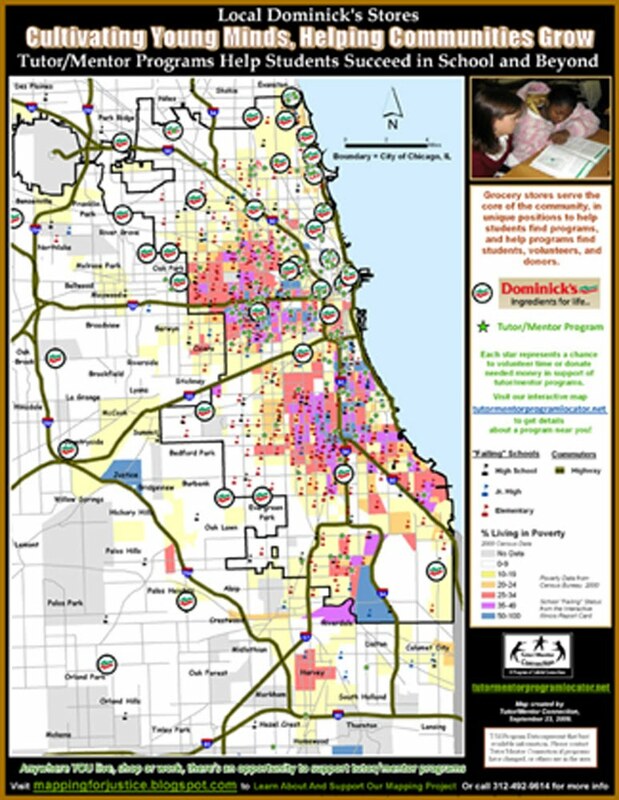 While we all want more kids to stay in school and be prepared for jobs and careers, someone needs to be building a knowledge base that includes information about all of the tutor/mentor programs in the city, if we’re going to learn what works, and help each of the programs get the resources to put what we learn to work in building great programs in every poverty neighborhood. Collecting information about tutor/mentor programs is a huge challenge. Helping people come together and learn from this information is another challenge. Because we’ve embraced the potential of the internet we’re drawing people to our web sites who are already interested in what we have to offer. 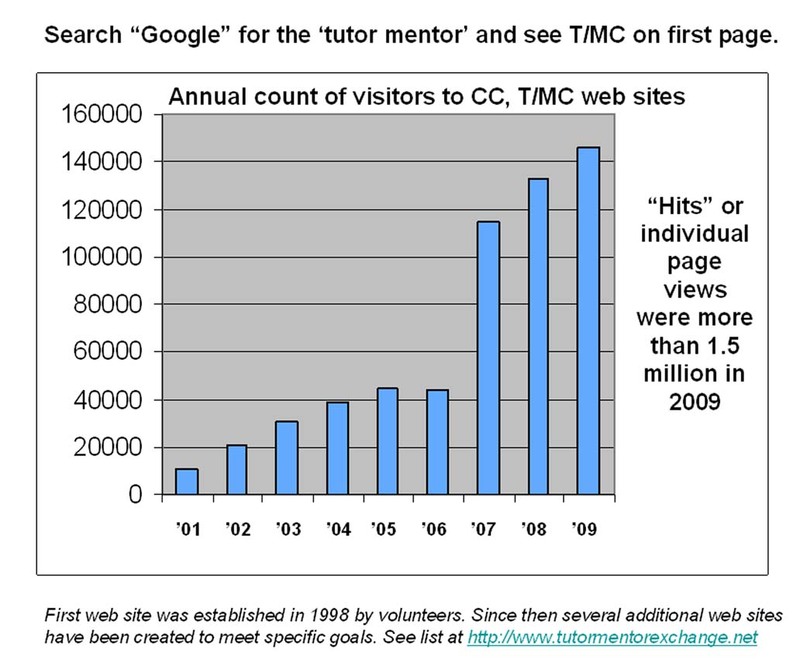 The chart below shows the growth in web visits to to CC, T/MC sites since 2000. In the T/MC links library we share the experience of others. For instance, this site on web evangelism provides useful information that any non profit could use to attract volunteers and donors. These blog articles provide even more ideas that any non-profit, including Cabrini Connections, can use for fund raising, volunteer-recruitment and information networking. 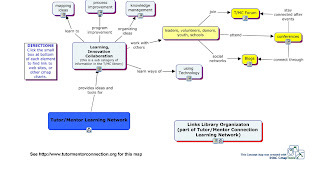 The links in this section show ways to collaborate, innovate, manage knowledge, and solve problems. On the T/MC Ning site we’re coaching volunteers and interns to help us communicate our ideas via blogs and visualizations. High Quality Complementary Learning Programs, Learning Point Associates. We have been connecting with others via blog exchanges since we started this blog in 2005. While we've had less money for traditional print media and advertising, we’ve embraced the Internet, and share our ideas on-line. We’re reaching far more people each year than we were in 2000. The articles posted above show that the network building and relationship building of the early and mid 2000’s is now leading to work by others that shares T/MC ideas in their own networks. This is still just a whisper in the internet world. We not only need to find funds to invest in greater advertising and social networking, but we need to find ways to help people understand and use this information. We need to find ways to expand the number of people who understand and share this information like I do and we need to find funding so that I can spend more time in meeting with people in face-to-face events that are held in other cities. While I know that what we do on the Internet has power, it is not a total substitute for face-to-face networking and relationship building. The 4-part strategy shows that step one is collecting and organizing information. Step two is increasing attention and the number of people who look at the information. Step 3 focuses on helping people understand and use the information so that in step 4 more people are taking actions that support high quality tutor/mentor programs in more places. Tomorrow we’ll post an article about accountability and actions we and others need to take daily to help constantly improving tutor/mentor programs reach youth in more places. Then we’ll conclude with an analysis of funds available to do this work and opportunities that would result from more funds becoming available. 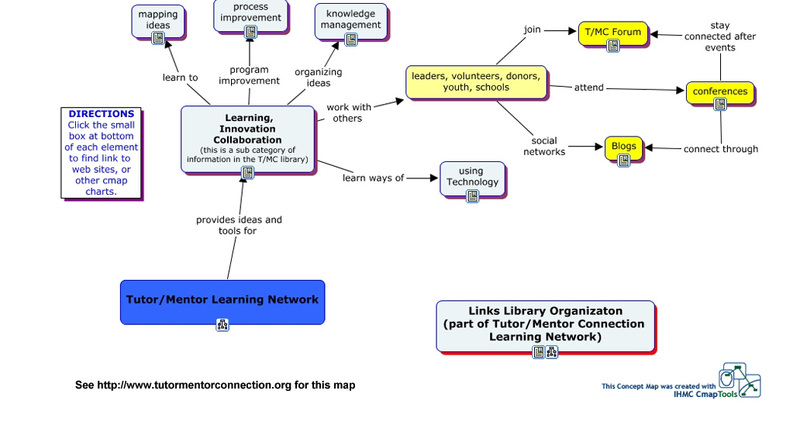 See the Tutor/Mentor Connection library of ideas. Learn ways to become a sponsor, donor or beneficiary. Hope you all enjoyed Christmas Day, in what ever faith you worship. I went to Chinatown in the morning to pick up my wife's Dad and bring him to our home for dinner. I stopped in my office to see if we had any mail from Friday, and found about $8,200 in donations. That brings our total to about $65,000 in December. Our goal is $100k or more. In today's Chicago Tribune I read how Julius Peppers of the Chicago Bears made a $100,000 donation to support Big Brothers/Big Sisters of Metropolitan Chicago. I think that's great and congratulate BBBS on receiving the donation. However, I hope that the other members of the Bears, Bulls, Blackhawks, etc. will also make similar donation, but not all to the brand name organizations like BBBS, Boys & Girls Clubs, Junior Achievement, etc. 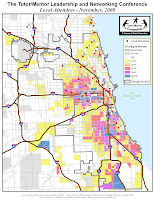 If you read the map stories, and sports stories, we've written, there are many programs in different parts of Chicago that are not as visible, but are doing good work and need funding to sustain their efforts. Our own Cabrini Connections program is led by a former football player at Northwestern who has many friends in pro sports. 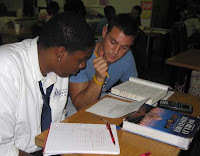 He has been writing a series of blog articles showing how the tutor/mentor program is like a football team. The players on the field (tutors, students, staff) need to be supported by fans, front office and investors if they are to be as good in the game of tutoring/mentoring as they need to be. 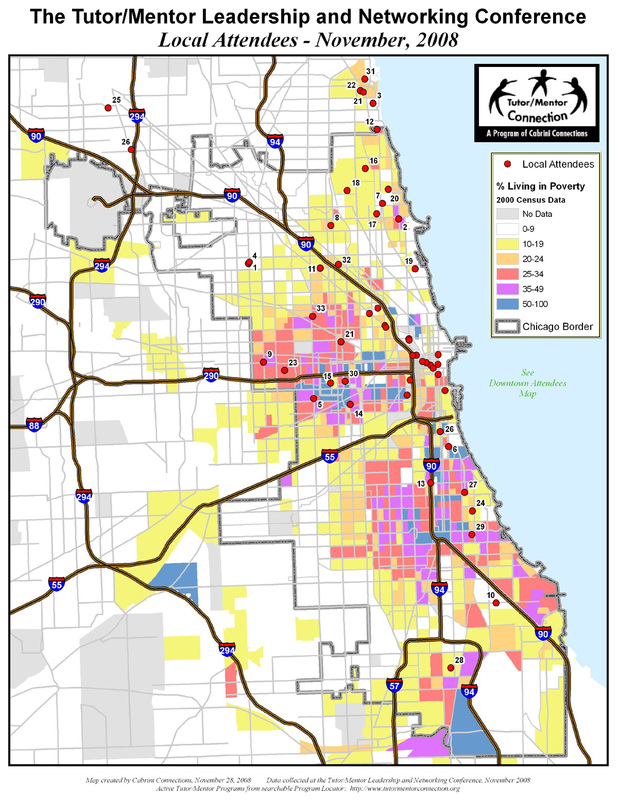 This map shows a vision of athletes adopting different neighborhoods of Chicago, and supporting programs in those neighborhoods with time, and dollars, and as leaders. Thus, in an article such as that written today in the Tribune, the writer could have ended by saying, "and there are more places like BBBS" where donations are needed. Perhaps sometime in 2011 the media could be writing stories showing how athletes are working as a TEAM to help make constantly improving tutor/mentor programs available to all of the neighborhoods of Chicago where great programs are needed. We'd like to help make that happen. This is the fourth in a series of decade-ending articles I’m posting to show the work we’ve done in the past decade and the challenges we’ve overcome. As you read today’s article, I encourage you to read some of these articles showing the value of informal networks, and how expanded social capital influences behavior. Also read some of these articles about collaboration and network building. Our aim is to connect inner city youth with volunteers in structured, non-school tutor/mentor programs. When we launched Cabrini Connections in 1993 we had seven volunteers and no money. 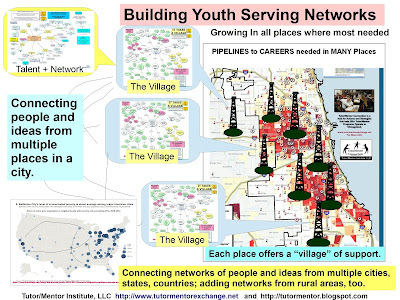 There was a perception among many that there already were too many youth programs in Chicago. How were we going to find the money, volunteers and ideas needed to build our own organization into one that had a life-changing impact on teens and volunteers if we could not find the resources to do this? At the same time, my 17 year history of leading the tutor/mentor program at Montgomery Ward, and networking with peers, had convinced me that no one had a master database of tutor/mentor programs, and thus no one was able to encourage networking and idea sharing, or create advertising-based marketing strategies that could help tutor/mentor programs grow in every high poverty neighborhood. 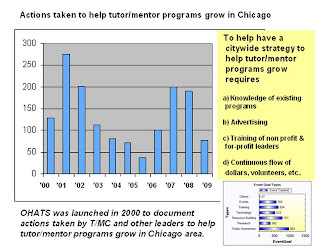 In January 1994 we launched the Tutor/Mentor Connection survey to determine what programs were in Chicago, what type of tutoring and/or mentoring they offered, what age group they serve and where they were located. We’ve been mapping this information since then. I wrote about this on Monday. 120 programs responded to the first survey, telling us they offered some form of tutoring and/or mentoring. 54% said they had “little or no contact with peers” and over 70% said they would like more contact. 90% said they would attend a conference if it fit their schedule and was at low/no cost. Thus, we organized a conference in May 1994, asking programs in the database to talk about what they do, and how they recruit and train volunteers. Catholic Charities on LaSalle Street in Chicago donated space. 70 people attended. We published our first Directory, and also launched a partnership with the Lend A Hand Program at the Chicago Bar Foundation to help raise dollars to fund tutor/mentor programs in Chicago. Enough people felt this first conference was a good idea that we launched a 2nd conference in November 1994 at the Shedd Aquarium and 200 people attended. We continued the May and November schedule of conferences through the 1990s with a maximum of 350 people attending in May 1999 when State Senator Barack Obama and Congressmen Louis Gutierrez were speakers. Mayor Richard Daley and Congressman Danny Davis have also spoke at past conferences. So did Paul Vallas. Our partnership with the Lend A Hand Program also grew, and the LAH used the May conference each year to pass out small grants to tutor/mentor programs. The conferences were not just a couple of days for networking and sharing ideas. They were part of an annual event strategy aimed at creating greater news coverage of tutoring/mentoring programs, which would draw more volunteers and donors to the different programs operating in Chicago. 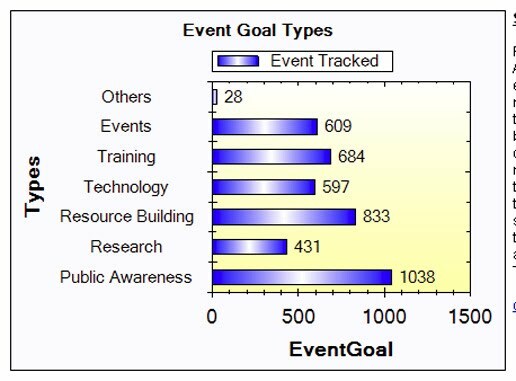 This chart shows the quarterly events that were developed during the 1990s to support this strategy. While the first conferences were organized in 1994, an August/September Volunteer Recruitment Campaign was added in 1995. 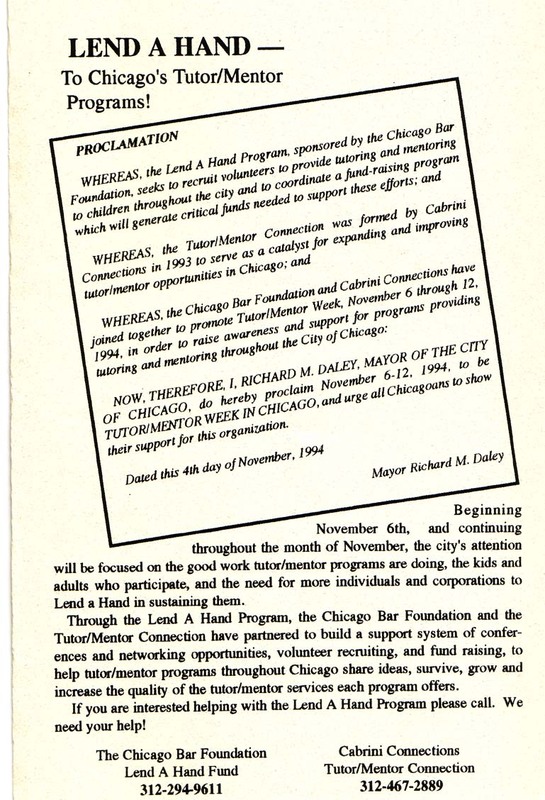 A Tutor/Mentor Week event was also launched in 1994, with the Lend A Hand Program at the Chicago Bar Foundation taking the lead in obtaining a proclamation from the Mayor of Chicago declaring Tutor/Mentor Week. By 1998 the Lend A Hand Program and Chicago Bar Foundation were organizing a November event at Chicago Museums that was attracting over 1500 guests. 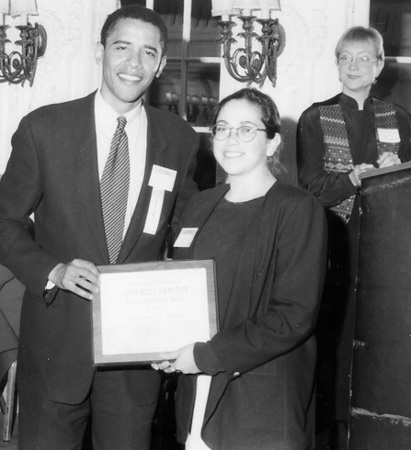 The T/MC was selected to be one of 50 Teaching Examples at the 1997 President’s Summit for America’s Future, held in Philadelphia. 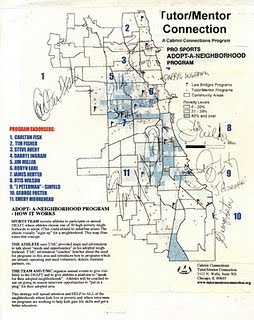 Each year these events led to TV, Radio and Newspaper interviews where T/MC talked about the need for tutor/mentor programs in all Chicago high poverty neighborhoods, not just its own Cabrini Connections program. Then came the Decade of Doom and Gloom (my name for the 2000s). This chart shows conference attendance since 2000. While we reached 450 or more people in 2000-2002 participation has ranged from 225 to 350 since then. 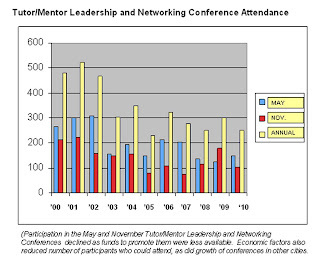 This chart shows funds that have been available from 2000 to 2010 to support all of the work of the Tutor/Mentor Connection, including the conferences. Without funds to rent space for the conferences, T/MC was often left with little time to recruit speakers and promote the conferences. Without dollars for marketing, T/MC was not able to print and mail newsletters and invitation brochures. All conferences since 2000 have been organized and promoted totally by email networking. Yet while attendance had declined, the conferences are still drawing participants from throughout the Chicago region at this map of the May 2008 conference shows. The conferences have always depended on the participation of people from other programs in Chicago and beyond, who volunteer their time to be speakers and participate in panels. 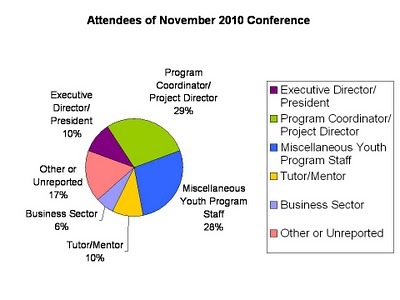 Fifty-six organizations have attended five or more conferences between 2000 and 2009. Big Brothers Big Sisters of Metropolitan Chicago, East Village Youth Program, Associated Colleges of Illinois, Family Matters, Juvenile Court Mentoring Network, Midtown/Metro and Chicago Lights Tutoring Program each attended more than half the conferences during this period. In this video leaders show why they participate in these conferences. Conference Capacity from Cabrini Connections on Vimeo. This is another video showing what conference participants say about participating. This page has a list of speakers and workshops from conferences offered in the past decade. With the help of software donated by Valdis Krebs of Orgnet, who spoke at the November 2009 conference, T/MC has begun to map the participation of past conferences. This map shows attendees of 2008 conferences. See more maps like this at Conference SNA Blog. This analysis shows the feedback from the most recent conference in November 2010. The conferences are also attracting participants from other cities and states. Speakers and participants come from Milwaukee, California,Iowa, New York, Ohio and many other states. We've already been contacted by a group from Canada that wants to present information in 2011. 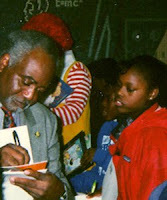 In 2000 the conference hosted leaders from the Hospital Youth Mentoring Network. This photo shows leaders from the University of Toledo at one of the conferences. 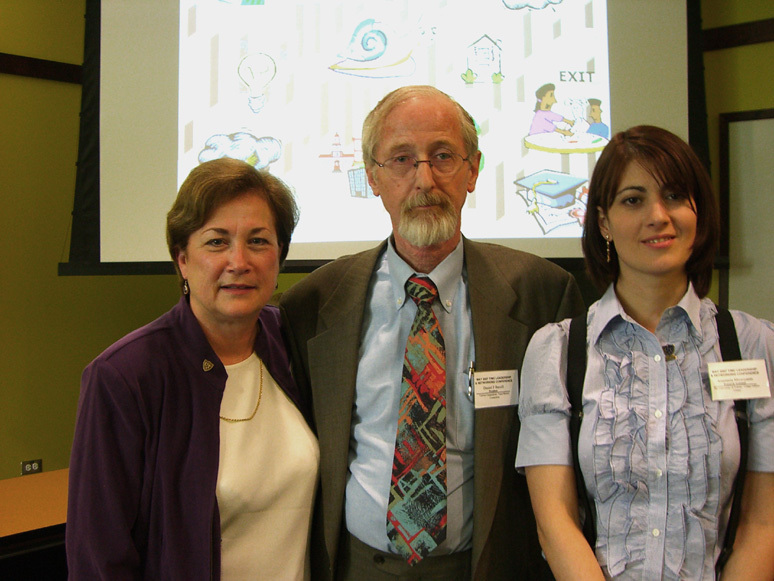 In August 2010 Dan Bassill was the keynote speaker at a Mentoring Summit held in Indianapolis, organized as a result of participation in the Chicago conferences since 2000. The T/MC main web site was built by the technology department of IUPUI in 2005 as a result of networking from the conference. Thus while we have drawn fewer people to face-to-face conferences during the past decade, we’ve helped hundreds, perhaps thousands, of people connect with others and learn ideas that they can use in their own organizations. We’ve also expanded our use of on-line forums to connect and share ideas. At http://tutormentorconnection.ning.com we have more than 300 members. I’m connected to more than 500 people on my Linked in and Facebook pages, including more than 100 former students of Cabrini Connections. By participating in forums at http://www.socialedge.org , Fireside Learning, Learning to Finish, Mentoring Forums and others, we are reaching countless other people who will never come to the Chicago conference but who can benefit from T/MC ideas and the ideas we share on our web sites. 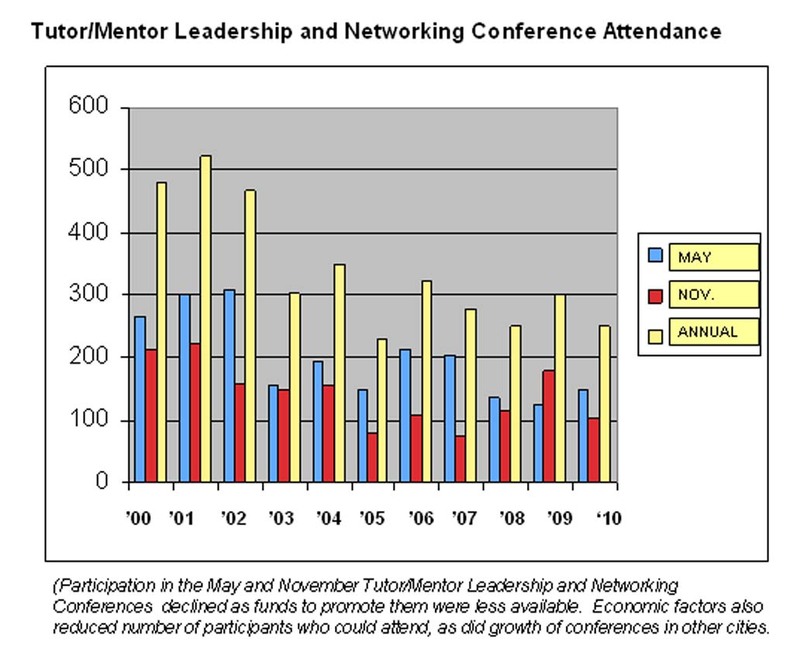 Thus, while the past decade has made it difficult to organize and market the May and November Tutor/Mentor Leadership and Networking Conferences, we have done a lot of network building with a small amount of funding. 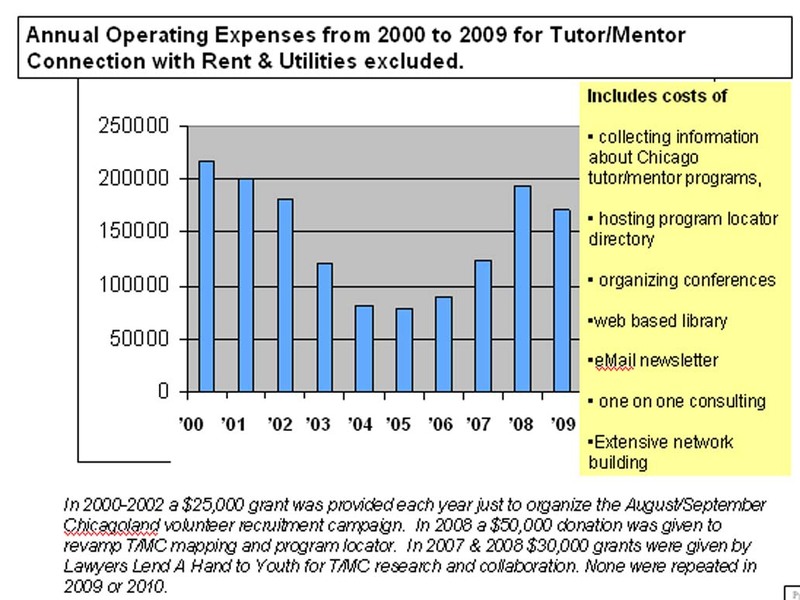 Yet, what might be possible if T/MC had a half-million or a million dollars a year to support its market-research, network building, information sharing and advertising advocacy and fund raising for tutor/mentor programs in Chicago? Read blog exchange articles and see another way we connect and share ideas with others. Next article will focus on network building. While the article I wrote yesterday about how Generals and leaders use maps focused on Geographic Information Systems (GIS) and traditional maps, leaders use many kinds of visualizations to help teams of people work together on complex problems. No building would ever be completed without first having an architectural drawing, financial plan and blueprint. Since we're focused on helping youth born in high poverty move through school and into jobs and careers, this would be my visualization of that vision. This is intended to emphasize the need for age-appropriate supports at different age levels and shows a role of business leaders and volunteers. It also includes a map with poverty areas highlighted. 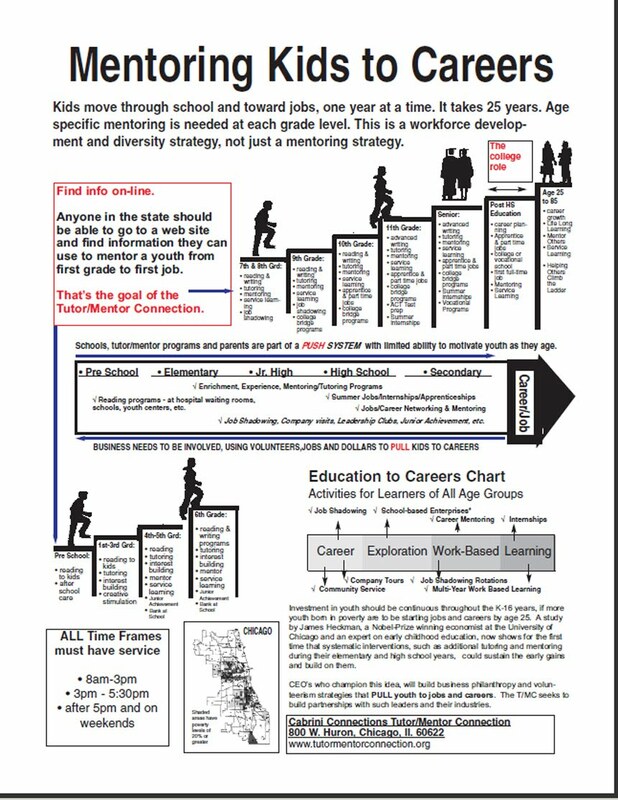 If you visit the web site of people who want your business, or who want to be elected for public office, do you find visualizations showing what their strategies and commitments to helping kids to careers are? 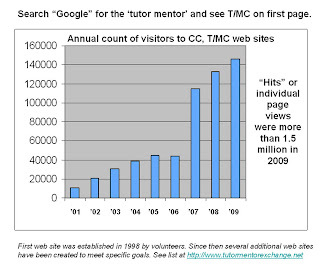 Over the past decade T/MC has engaged volunteers and interns to help us expand our use of visualization. 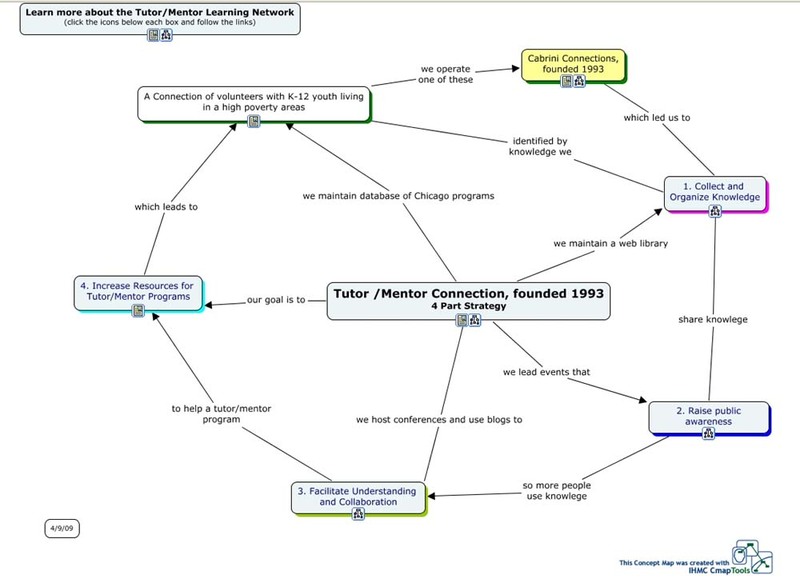 Below is the 4-part strategy of the Tutor/Mentor Connection, created using free CMap software. 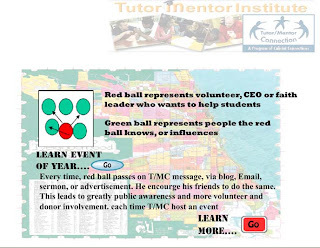 Below is a visualization of the event strategy of the Tutor/Mentor Connection, converted to a flash animation by an intern from Korea. 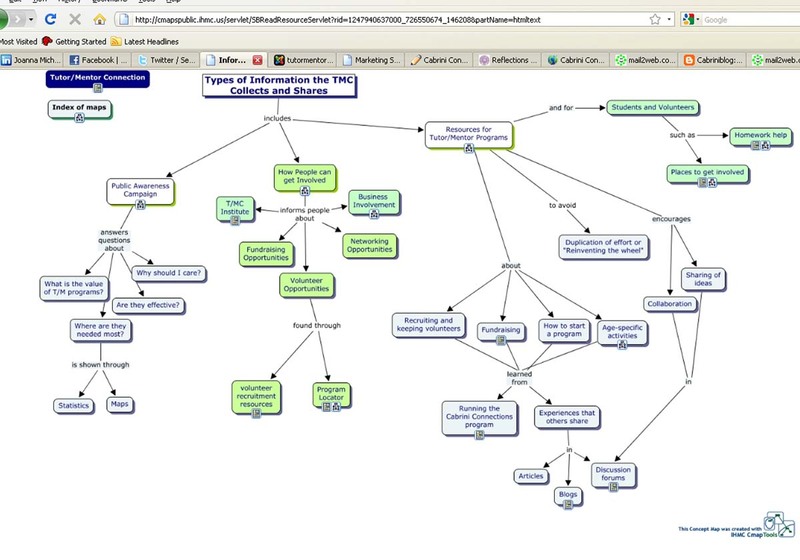 See more animations of T/MC ideas created by interns from IIT and the University of Michigan. 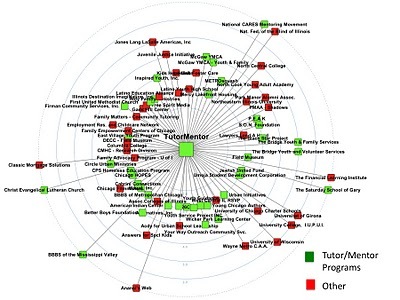 Below is a map of participation in a tutor/mentor conference, created using Social Network Analysis software. See more conference maps. See blog articles where visualizations have been used to illustrate ideas. 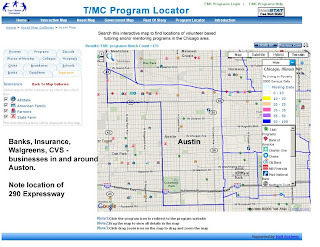 See how Social Network Analysis maps are being created by volunteers working with T/MC. These are just samples of work that has been done in the last decade. 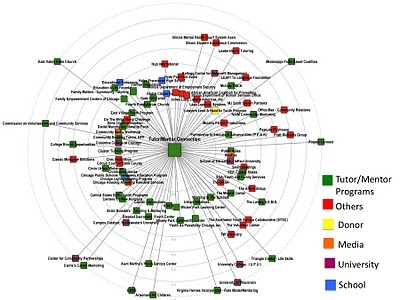 Imagine what might be possible if universities and high schools create on-going partnerships with the Tutor/Mentor Connection to visualize these ideas and share them with thousands of people. This is the third in a series of decade-ending articles I’m posting to show the work we’ve done in the past decade and the challenges we’ve overcome. Our aim is to connect inner city youth with volunteers in structured, non-school tutor/mentor programs. When we started Cabrini Connections in 1993 we realized that one more small program would be a great benefit to the youth it served, but would not make much impact in a city with more than 200,000 youth living in poverty. We also recognized that small non-profits have a difficult time attracting volunteers and dollars which are continuously needed to grow from good to great, and then stay great for many years. We decided to try to address this need in order to help our own Cabrini Connections program succeed. We created the Tutor/Mentor Connection. We began to see the value of using maps to show where tutor/mentor programs are located in 1993 when we were initially researching the feasibility of offering the Tutor/Mentor Connection. 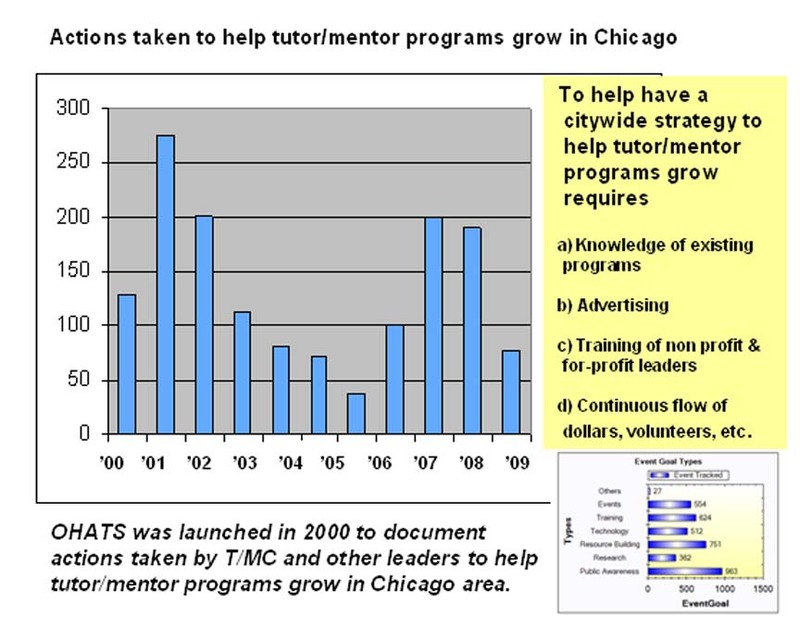 With the help of Metro Chicago Information Center (MCIC) we launched the first tutor/mentor program survey in January 1994. 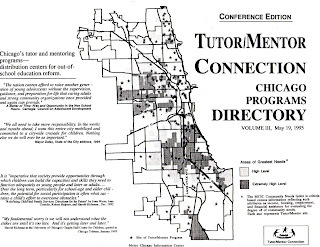 Then with help from IBM, ESRI and various volunteers we were able to launch a system to produce maps in 1994 showing the distribution of tutor/mentor programs in Chicago. 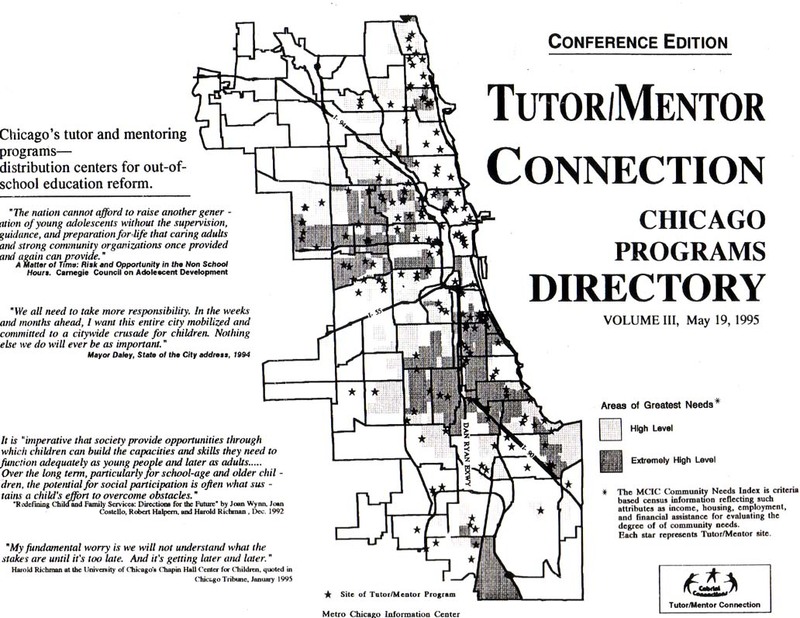 We published our list of Chicago non-school tutoring and/or mentoring programs as a printed Directory in May 1994 when we launched the first Tutor/Mentor Leadership and Networking Conference. 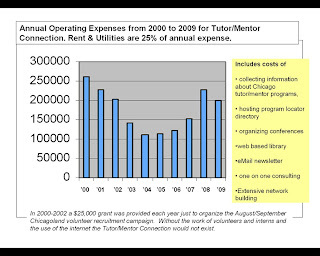 We continued to print and distribute a Chicago tutor/mentor programs directory until 2001, when we had to discontinue this due to lack of funds. At its peak in 1997-98 we were sending a print newsletter three times a year to 12,000 people and the printed directory once each year to about 400 organizations, foundations, media and business leaders. With each directory we used maps showing where poverty was most concentrated and where existing tutor/mentor programs are located. From 1996 to 2003 we built a variety of maps and shared them via our newsletters with a growing number of people. 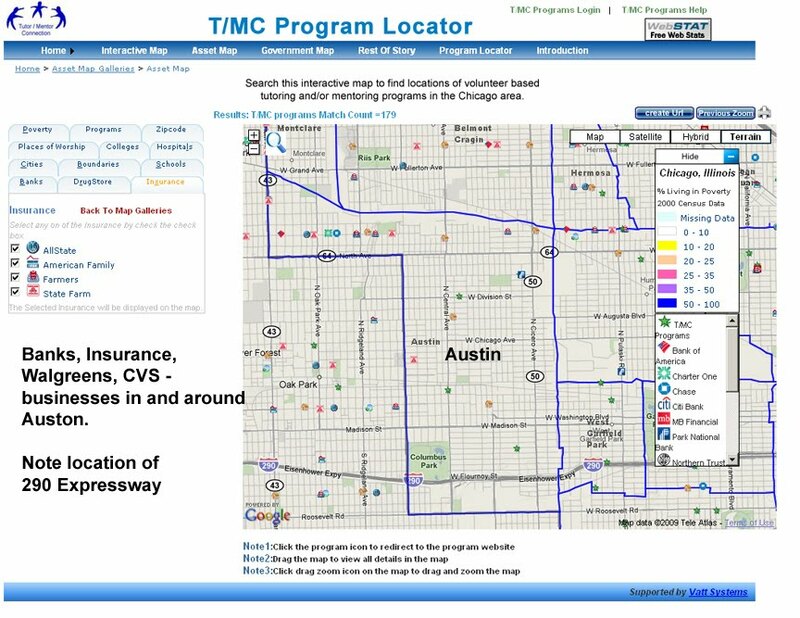 Our intent was to use maps like this to help business with building strategies that encouraged volunteer involvement near where they do business, or where customers live. We also wanted to help individual tutor/mentor programs build strategies that would attract volunteers and donors to their own locations. In addition, we wanted to use maps to follow high profile media stories with “map stories” that drew volunteers and donors to neighborhoods made visible by negative news reporting. We don’t have the money to buy the front page of the Chicago SunTimes, but when they feature negative news on the front page, it is worth over $250,000 in advertising costs. By creating “rest of the news” map stories, like the one below on a consistent basis, we hope to draw more consistent attention, and volunteer/donor support to the tutor/mentor programs operating in these neighborhoods, or to help new programs form where there are voids. 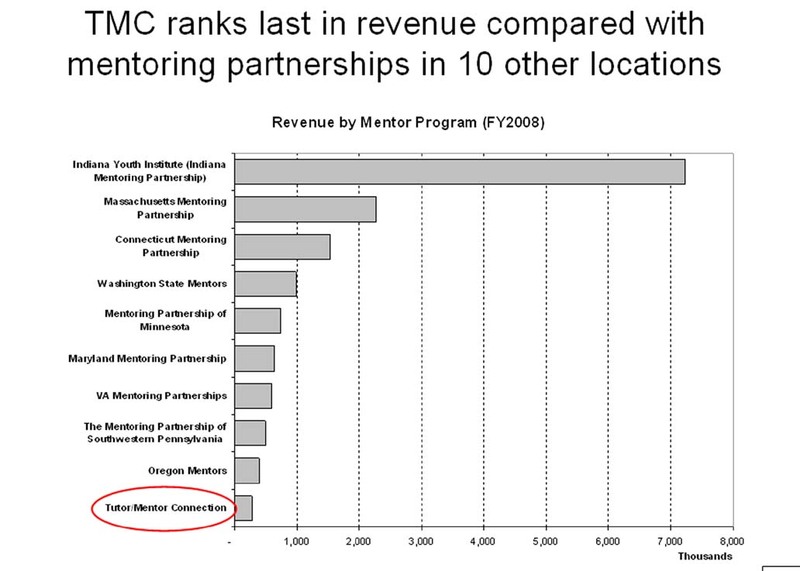 Unfortunately we entered the past decade without funding to support T/MC research and map making. Yet we made some significant strides in the past decade. Jim Cory, from Horizon Mapping, based in Madison, Wisconsin produced maps for us several times a year between 2000 and 2005 and built the first map based directory. 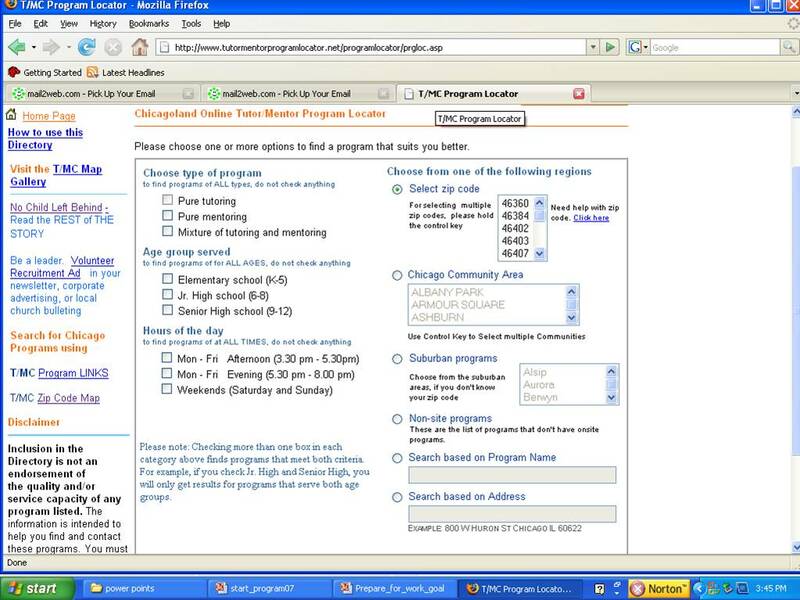 In 2004 we launched the first searchable Program Locator that enabled programs to add/edit their own information and enabled parents, volunteers, donors and social workers to search by type of program and zip code. In 2007 an anonymous donor provided a $50,000 gift which enabled us to hire Mike Trakan on a part time basis, starting in Jan. 2008. Mike rebuilt the desk-top GIS so that we could consistently produce high quality maps like these shown in the Map Gallery. MAP link to see dozens of map stories created using this program locator. 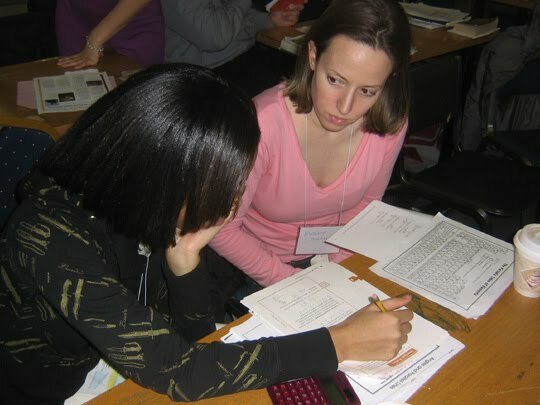 We've never had much month to offer the Tutor/Mentor Connection to Chicago. The chart below illustrates that we had less than $150,000 per year between 2002 and 2007. However, as we finish the decade we are right where we were at the start. We don’t have money to keep the map making and program locator on-line, and to continue to keep the tutor/mentor program data current. We don’t have advertising dollars to tell more people about the maps and how they can be used. We’ve shared this commitment, and offered the T/MC strategy and resources to the Mayor and other leaders since 1994. We’re still doing that and hope the next Mayor reaches out to embrace these ideas more consistently. Review T/MC resources that are now available on line to any user. 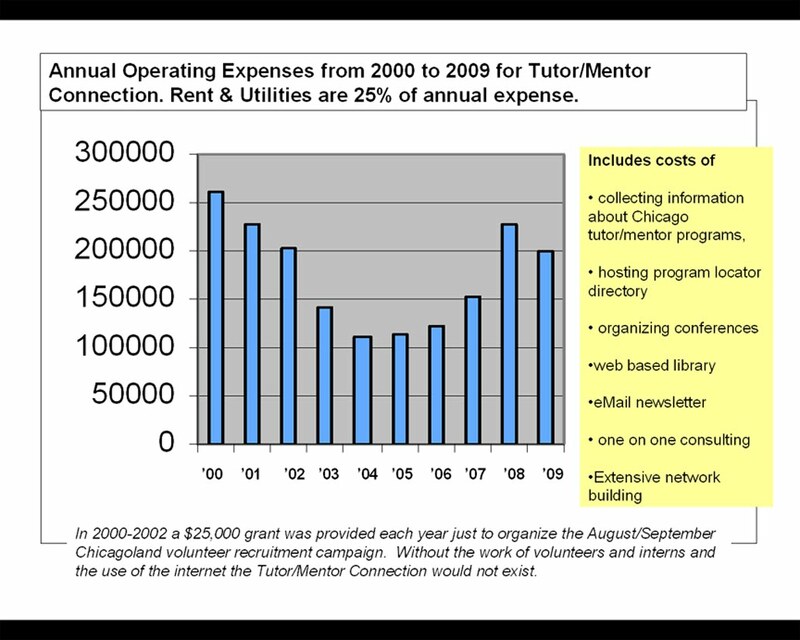 In my final article next week I’ll show how funding for the Tutor/Mentor Connection in Chicago is far lower than for different city and state mentoring-support groups operating around the country. 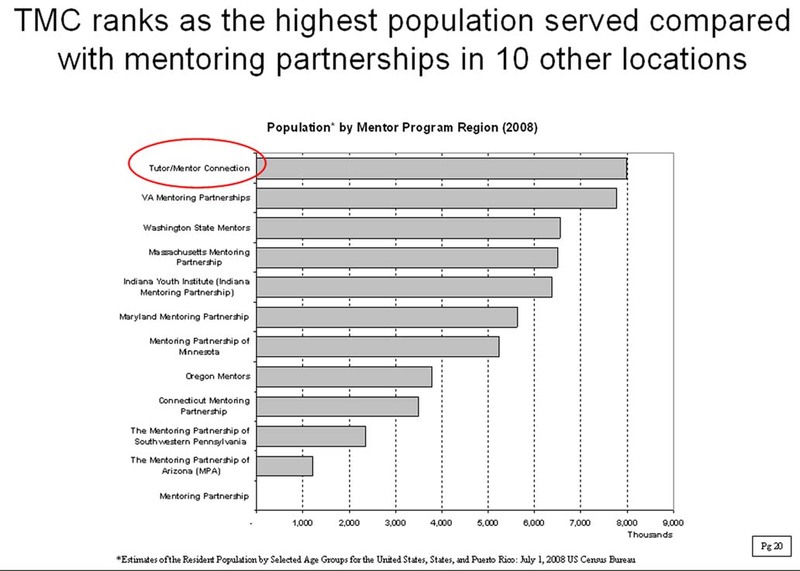 Without raising the level of funding for the Tutor/Mentor Connection to at least the middle of this group, we cannot support the growth of tutor/mentor programs in all the places where we need to do this. Where do we get ideas for innovation? I’m writing articles over the next 10 days showing the work we’ve done in the past decade and the challenges we’ve overcome. Our aim is to connect inner city youth with volunteers in structured, non-school tutor/mentor programs. Tangela is one teen who was with us for several years in the 1990s. She’s now a college graduate, mother, part of the work force, and getting a MBA! In this video she talks about how we’ve had a “transformative” impact in her life. But where did we get our ideas? "When nonprofit and community leaders share ideas, insights and information in ways that promote social impact...knowledge-sharing can improve organizational effectiveness. When we share what works and what doesn't... it results in accelerated learning, less reinventing the wheel, better service, and measurable results." I’ve been living this quote since 1976 when I first started to invite leaders of other tutor/mentor programs in Chicago to come together for monthly “lunch & learn” sessions. In 1993 when we launched the Cabrini Connections tutor/mentor program in Chicago we also launched the Tutor/Mentor Connection. Its purpose was to share what we had learned in the previous 17 years, and to collect and share information from others in Chicago and around the world. We did not know it at the time, but we were getting into the business of Knowledge Management. When we add an article to our web site, and point to the work someone else is doing via a link, we are making what we know available to the someone who visits our web site five minutes later, and to everyone else in the world who visit our web site ever. By focusing the information we collect and share on ways to mentor youth from birth to work, we make our information more useful to anyone who visits our web site who is interested in this same purpose. This map shows the different types of ideas we point to. This link goes to the actual site and this goes directly into the Links Library. 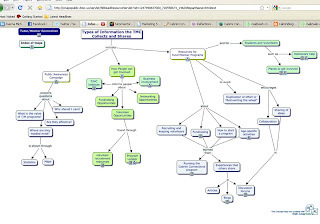 The map above is one of four major categories of information we collect and share. This map below shows the total range of information we collect and share. This is the actual site. 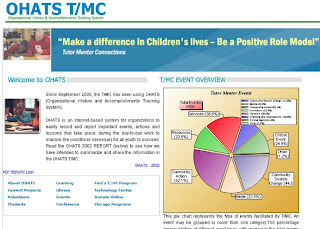 Because we have put this information on-line in the past decade, and organized it this way, leaders, volunteers and students at the tutor/mentor program I led can use it, and so can anyone else in the world who is concerned about making the work they do to help kids grow from birth to work over a 25 year period. This is one of the past decade's achievements of the Tutor/Mentor Connection. This Knowledge Network did not exist in 2000 and won’t exist in future years unless we can find donors who want to support this part of our work. Our mission at Cabrini Connections is to connect youth and volunteers in a structured set of activities where the volunteers serve as tutors, mentors, coaches, friends and make a life changing difference. Our roots go back to 1965 when employees from the Montgomery Ward Corporation in Chicago began to tutor elementary school kids in the Cabrini-Green area. View this chart to see growth from 1965 to 1992. View this chart to see growth since the formation of CC, T/MC in late 1992. The two teens in this photo are 1999 graduates of Cabrini Connections. Both now have Master's Degrees and one is pursuing here MBA. Over the next two weeks I'm going to write a few articles showing what Cabrini Connections and Tutor/Mentor Connection have accomplished and the challenges we have faced in the effort. Below is a chart that shows the number of teens on our active roster each spring since 2000. 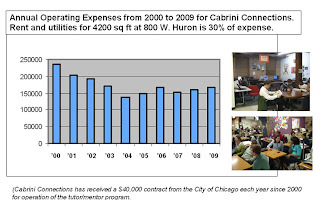 In 1999 we left 20,000 sq ft of donated space at the Montgomery Ward Corporate Headuarters in Chicago and began to rent about 2500 sq ft of space in Cabrini Green for the operations of Cabrini Connections. Thus, the number of students who could participate was reduced to a maximum of 80. Through the decade we've started each year with 75-80 students and kept most of them till the end of the school year. 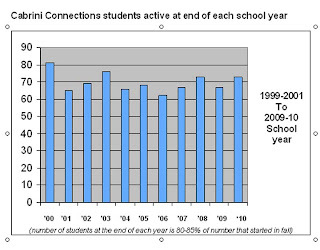 This chart shows that 40-70% of the students in each year's class had participated for three up till six years. That means that not all kids who joined in 7th or 8th grade continued through high school. Some moved. Some went to scholarship programs like Highsight, with our help. Some decided this was not right for them. Teens vote with their feet. However, research shows that "Although the benefits of afterschool programs for older youth are abundant, and awareness of the need for afterschool is growing, many programs still struggle to recruit and retain older students." Thus, for Cabrini Connections to recruit these 7th to 12th grade students and keep so many participating for 3-6 years, the program must be offering perceived value to the youth who participate. This next chart shows the number of seniors who finished high school each year. Many of these students have already finished college. That means that based on the number of students who have participated in Cabrini Connections, and just those who we know have graduated from high school, we've potentially saved society $120 to $300 million dollars. However, look at this chart that shows the money we've spent each year to provide Cabrini Connections. The amount we spend is based on how much we can raise. 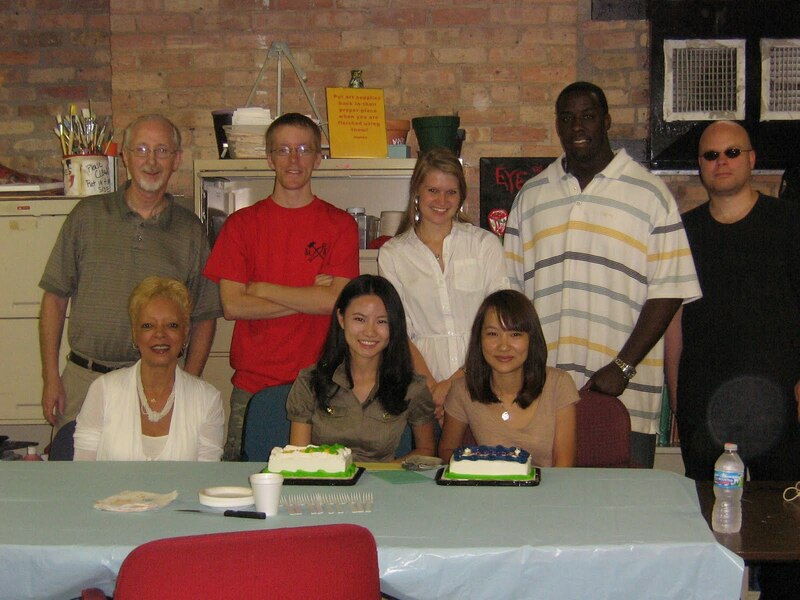 There were seven volunteers when Cabrini Connections started in 1993. They had no money to fund the organization. Every year we've had to raise the money to fund the operations of that year. While we had support from the Montgomery Ward corporation, and free space, until 1999, we lost that support when the company went out of business in 2000. Then the dot.com bubble burst, 9/11 happened, and then came tsunamis, hurricanes, earthquakes and a 10 year war. While we had $200,000 for operations in 2000 and 2001, we've spent between $150,000 and $175,000 each year since then....and almost 25% of this was for rent, insurance and utilities. This final chart shows total expenses (including fund raising and administrative costs, which are under 20% of total expense each year). 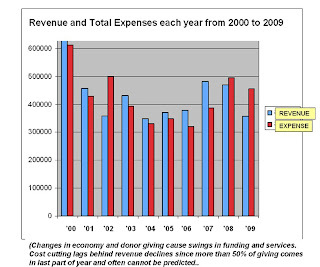 The chart shows that we spent more than we raised in 2003, so we cut costs dramatically for the next five years. We received several gifts of $30,000 to $60,000 in 2007 and 2008 that enabled us to invest more in our programs, but we've in the past two years we've spent more than we've raised. That means unless we can find donors who value the long-term impact of a program like Cabrini Connections, and who will provide significant donations, we will cut back on staff, and services, and not be able to help these kids realize their great potential. 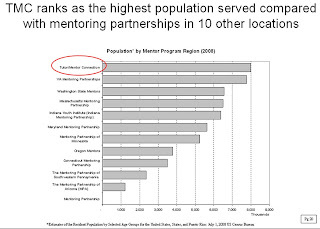 Next I'll show the story of the Tutor/Mentor Connection and how the last decade has presented numerous challenges to our efforts.